Crunchy and refreshing, cucumbers are the ultimate base for a lemon and dill shrimp salad. 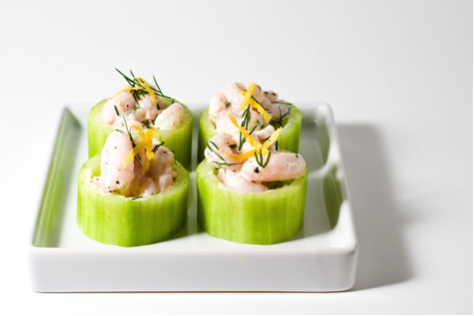 Cucumber cups are easy to make and make for a neat one bit appetizer. Cut off the tips of the cucumber. Peel the cucumber skin using a vegetable peeler. Cut the cucumber into about 3/4 inch slices. Use a melon baller to scoop out half the flesh from the centre of each slice. Make sure you leave a bit of base intact to create a cup. Mix together the mayonnaise, lemon juice, dill and lemon zest. Gently stir in the shrimp. Season with salt and pepper to taste and scoop into cucumber cups.